I saw this story yesterday and forgot to post it, but St. Louis Cardinals manager Tony La Russa is suing Twitter over a fake account. 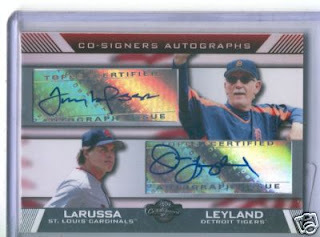 Someone was impersonating LaRussa and, well, he wasn't going to take it anymore. There are sports stars out there that use Twitter. While most of the time the content isn't very enlightening, it's exciting to their fans to have a way to communicate in a way that never existed before. These fake accounts make the usefulness of Twitter difficult and take away from the bit of credability that it actually has. La Russa isn't the only one who deals with these types of issues. Apparently, Philadelphia Phillies shortstop Chase Utley begain tweeting and swore he was Utley. The Real Utley. One day he tweeted that he was bored at home and headed to the park. Meanwhile, I was sitting in the Phillies dugout watching Utley field ground balls. I contacted the Phillies PR about the account and they have refuted it saying it's not Utley. Even then, the account swore it was Utley and said the Phillies PR was wrong. So it begs the question: What the hell is wrong with these people? Why do people want to pretend to be someone else? Faking because lack of respect for your followers is like spamming mail boxes with made up names. Poor and utterly enoying. Because they think screwing with people is funny? I don't know if the lawsuit will hold up in court though. I mean, Twitter will be hard pressed to put an end to fake accounts. It's be next to impossible to certify evreyone is who they say they are. The Twitter people really need to address that. It happens a great deal. I don't know. The same reason people call in fake bomb threats? ok fake bomb threats in school were fun. after that not so much. There was a hilarious fake Brian Burke (Leafs GM) Twitter for a while earlier this season. Burke laughed it off, and the guy retired it after he had a good run. As obvious satire, I have no issue with fake accounts. As serious attempts to mislead, they are pretty lame. the satirical ones I have no problem with. I actually find them funny .... but the ones where people are trying to be someone else. It's so sad. You should've known it was fake if this Chase said he played shortstop.